Whitehall Manufacturing remains a leader in therapy and rehabilitation products, providing the healthcare industry with innovative design and always remaining ahead of the curve. While our standard products meet the conditions for most applications, we also eagerly welcome custom work to meet the various needs of our devoted clients. We take satisfaction in undertaking even the toughest custom projects. Included below are some examples of Whitehall’s custom projects. Discover how Whitehall’s team of engineers, project managers, and manufacturing staff can develop products that meet the unique desires and necessities of your application and facility. Do you have a small or unique space? Whitehall custom sinks may be the solution where other fixtures will not fit! Thanks to our cast solid surface material, we can vary the size, shape, depth, counter/surround area, color and configuration of your sink to suit your specific needs. Contact us to achieve the optimum room layout with a custom sink. 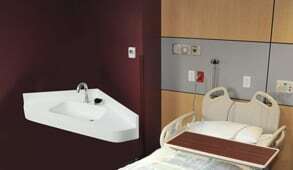 Care-Ware Patient Care Units blend luxury with style to promote maximum hygiene. 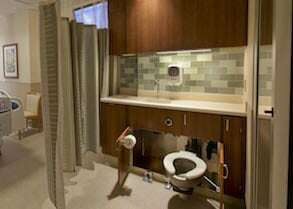 The Patient Care Unit is a combination free-stand or built-in cabinet containing a bed pan washer, fixed or pivoting toilet and deck mounted faucet, basin, countertop & wash sink. 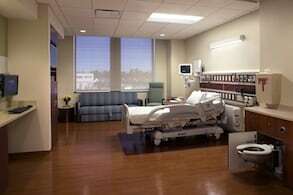 Each of these features is custom designed and manufactured to fit the specific needs of any healthcare application. Choose a Corterra® solid surface or resin countertop with custom Pantone® colors. Locate which end of the unit the sink needs to occupy, and choose from a fixed toilet with bedside seat or pivoting toilet and bed pan washer. Pivoting toilets can be ordered with an optional Infection Control Flush, allowing the flush mechanism to work only when the toilet is secured inside of the cabinet, further promoting maximum hygiene. Whitehall Mfg. Hydrotherapy Whirlpools are flexible in their application, durable in their construction, and effective in their design. Temperature and pressure exerted from water carry nerve impulses through the body, increasing blood flow and circulation while promoting relaxation and healing through reduced pain sensitivity. Whitehall Whirlpools are custom designed to meet the needs of any therapy application. Designed for athletes, trainers, and physical therapy enthusiasts, Whirlpools are built with sturdy and recycled stainless steel and hold water capacity from 10 to 110 gallons, perfect for any acute pain therapy necessary for injured arms, legs and back. Choose a custom Whirlpool wrap option with any design or logo, printed and wrapped to fit any locker room or physical therapy office. Choose from a variety of Whitehall Mfg.’s Dialysis Boxes, built with vandal resistant stainless steel and easily recessed into the wall of any healthcare application. Dialysis Boxes are custom built with one to two PVC or stainless steel valves, with or without customizable access door. We have hundreds of custom drawings to choose from since we have manufactured for clients over the course of decades. Whitehall Mfg. excels in the design and manufacture of custom Solid Surface Countertops. Available with an optional SteriTouch additive for antimicrobial protection, our custom cast solid surface countertops are resistant to cracking and maintain a Class A burn rating. Custom designs available upon request.